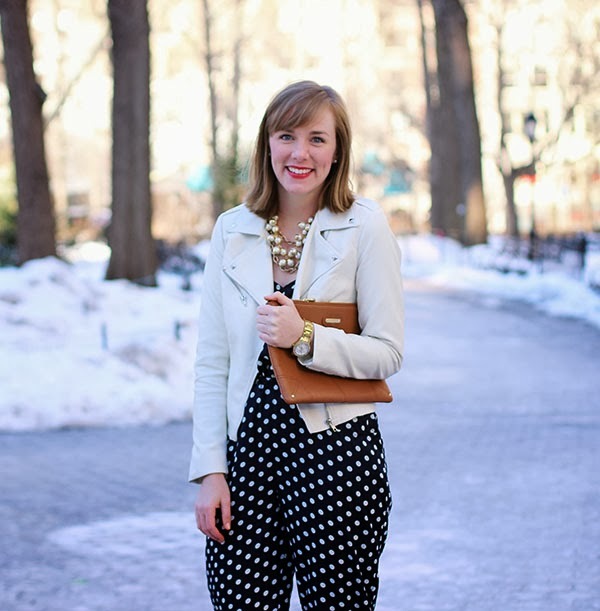 I'm teaming up with LuLu's for my latest in the "work to play" series and today I've challenged myself to wear this polka dot jumper for work (and play, but that post is coming next week - stay tuned!). I pulled this off for a Friday at the office because I'm not quite sure how it'd go over if I wore it to a client meeting or an event. Who knows, maybe I'll work up the guts for that when the weather gets a little warmer! I dressed it up with some wedges and a statement necklace but otherwise kept it simple and neutral because the pattern could be a bit much. What would you pair with this? Would you wear it to work? Love it! I've always wondered if rompers/jumpsuits can be dressed up a tad since I've always thought of them as being casual, but this is such a chic work look. You look great!